What is a Meat Grinder and What is it Best For? This article serves as a guide for individuals, whether cooking novice or culinary expert, who wish to purchase an at-home meat grinder. Our hope is that the subsequent information will be useful to those who aren’t quite sure which model to buy, or even for those who have no idea what they are looking for. With that in mind, we will briefly discuss what meat grinders are used for in the home setting, as well as a few qualities to look for in a great model. 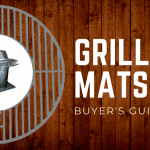 Following this brief introduction to meat grinders, we will move into focused reviews of the best meat grinders on today’s market. 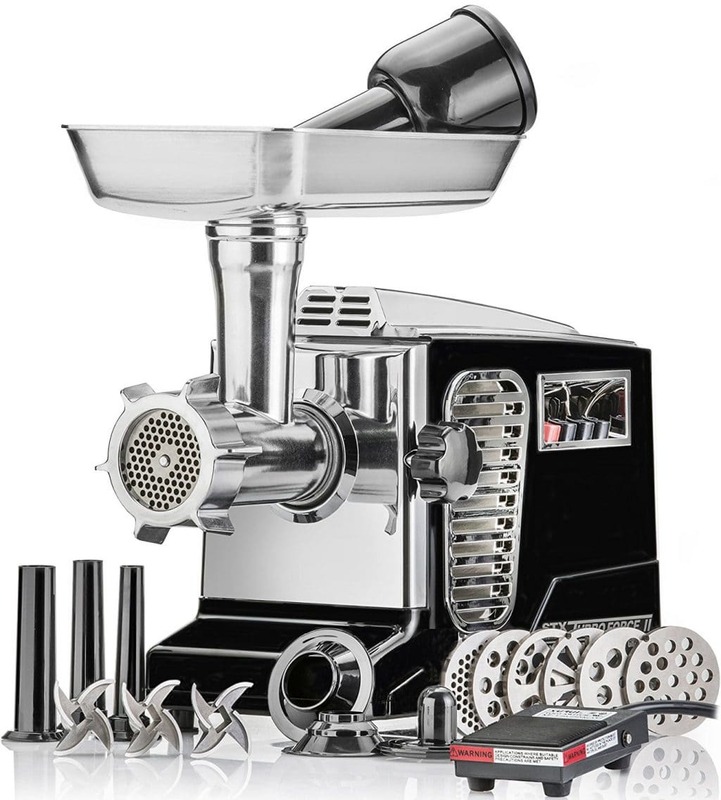 A meat grinder, otherwise known as a meat mincer, is a kitchen appliance that rapidly grounds raw or cooked meat, as well as soft bones and other foods in certain models. They are used by individuals who wish to avoid store bought ground beef, which often lacks good flavor and consistency, and can contain processed meat, or meat from an unknown number of animals. 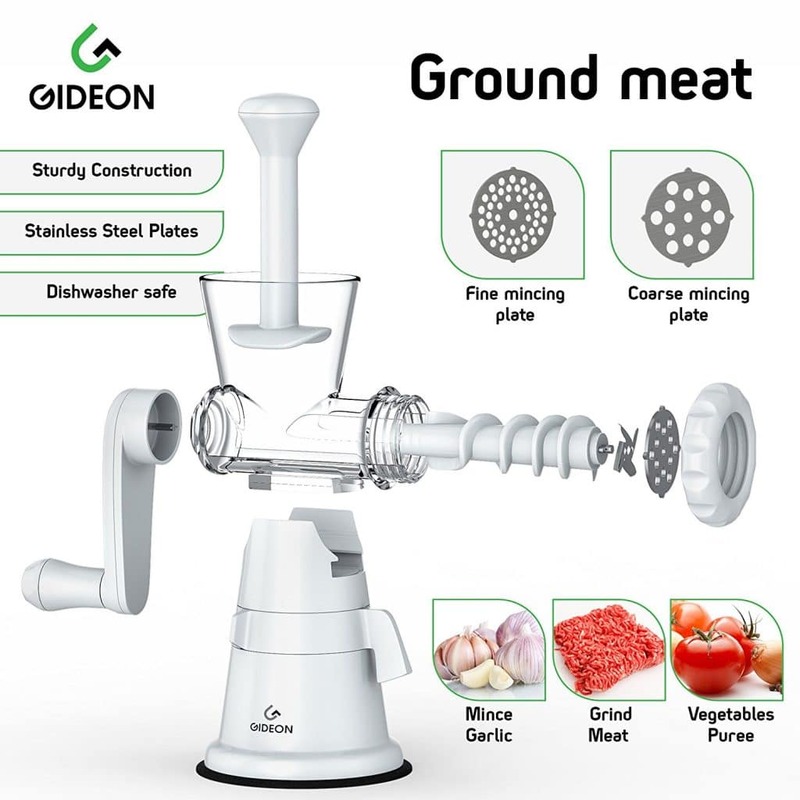 A meat grinder is the best option to ensure that the ground meat you are eating is safe, is not a heterogenous mixture of meats, and is of the highest quality in terms of texture and flavor. Meat grinders are often cited as a way for at home chefs to cut costs, as grinding one’s own meat, instead of purchasing packaged ground meat from the local butcher or grocery store. 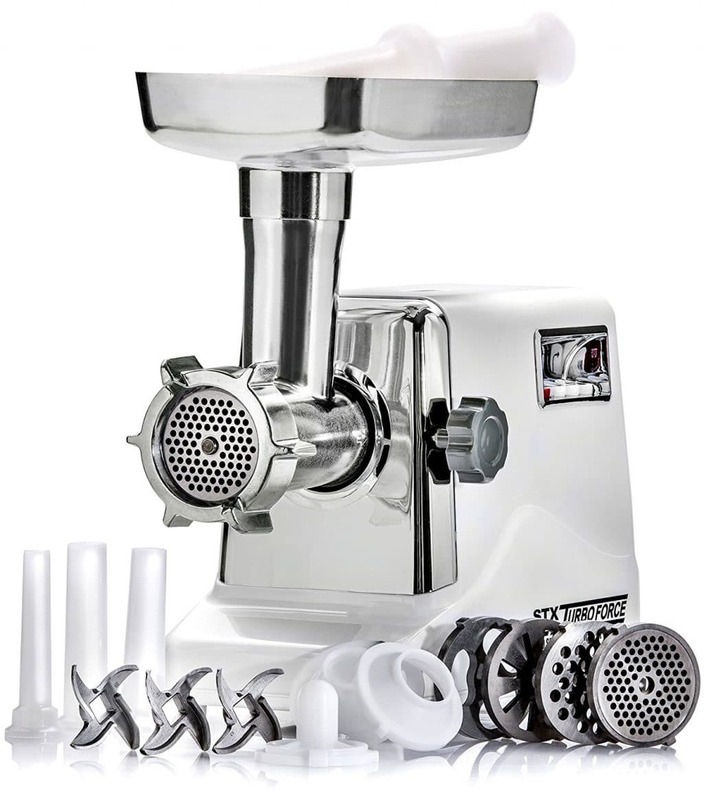 Meat grinders are often used to make hamburger meat, sausages, tartar, kibbe, pet food, and the base of a meat spread, as well any other dish/recipe that takes ground meat. As stated above, certain meat grinders have the capability to ground soft bone as well as meat; something many people utilize for pet food. Given that the ordinary home cook relies mostly on store bought meats, meat grinders are a relatively mysterious culinary tool. 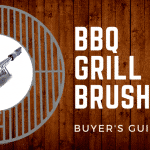 To help you understand the features that distinguish different meat grinders, let’s discuss some important qualities to look for when on the market. An ideal home meat grinder will produce quality ground meat, be efficient, be usable and safe, and be of reasonable size for a home kitchen. A grinder’s purpose, first and foremost, is to produce high quality ground meat. Being conscious of the metal used in the grinder is crucial here; stainless steel is optimal, as it is resistant to rust and corrosion, while also being the best choice for those looking to grind soft bone. In terms of product quality, it’s also important to be aware of both the grind plates and blades that come with the grinder, as these are what dictate the size and thickness of the meat. 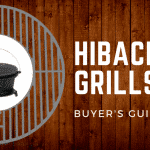 Efficiency, while often sidelined in favor of quality, is nonetheless a crucial characteristic of any good grinder; particularly for those looking to grind high volumes of meat. Efficiency comes down to grinder size (#12 or #22 being the standard “heavy duty”) and, if the grinder is electric, motor power (wattage). It goes without saying that electric grinders are significantly more efficient and user friendly, as they require little physical labor. With that, usability is another important factor to take into account. Many at home cooks prefer an electric grinder to a manual simply because it places less physical strain on the user. However, it is important to consider safety features if you choose to go electric, such as safety switches, and switch covers. Lastly, meat grinder size is a major deciding factor for many individuals. While larger models may be more efficient, their size and weight may be a burden in the kitchen. For those people who plan to use their grinder sparingly, smaller electric or manual models will be much more advantageous in terms of storability and counter space. Now we’re going to take a look at some of the best meat grinders on our list. With this, we’ll be outline their main features, then taking a look at some pros and cons. Let’s get started! Cited as Amazon’s choice of electric meat grinder, this model from STX is nothing short of fantastic. The small, lightweight machine boasts a 1200 maximum watt motor that is well suited for almost any home cooking project. Its modest profile won’t clutter your counter, but don’t let its inconspicuous size fool you; this grinder can yield up to 225 pounds of meat in one hour. Assembly and disassembly are both simplistic in nature and can be quickly understood by even the most naïve of cooks. Once you have the grinder set up, usage is simple and safe. Simply load the meat, press grind, and you’re good to go. In terms of cut quality and efficiency, customers lauded the STX-3000 Turboforce. Multiple users described the grinder as quick, efficient, and powerful, though not for the want of quality. In fact, customers went as far as to say that the grinder produced the same quality of meat that they’d find at a butchery. While this grinder may seem like a large investment, its numerous qualities see it stand out amongst the competition. Cooking novices and veterans alike need look no further for butcher quality ground meat at home than the STX International STX-3000-TF Turboforce Electric Meat Grinder. 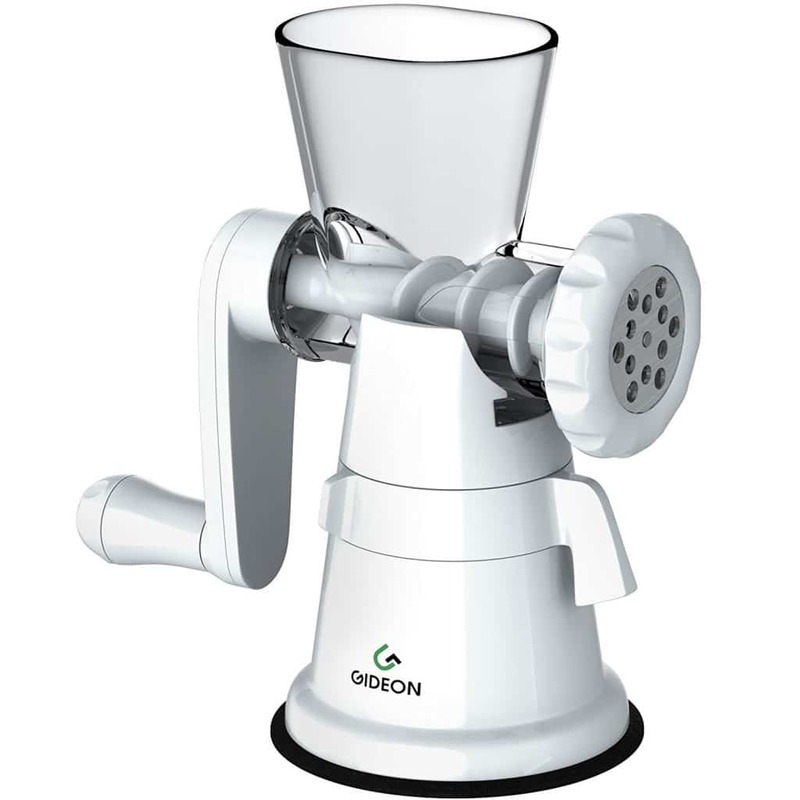 The Gideon Hand Crank Manual Meat Grinder is the most cost-effective manual meat grinder on the market. This compact grinder can fulfill all of your in-home meat grinding needs, while not overcrowding your kitchen. 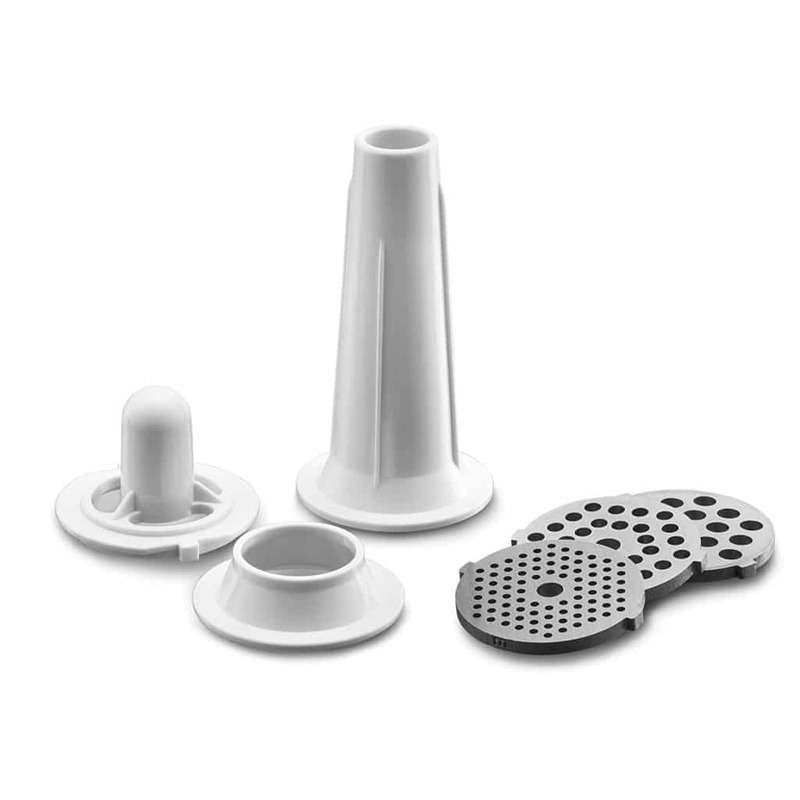 Its suction cup design allows it to be easily attached to your counter for grinding, then removed and stored with ease. Built with durable plastic and stainless steel, this Gideon model can handle any meat or vegetable you throw at it. Contrary to many competing manual grinders, this model boasts an incredibly ergonomic design, which allows the user to manually grind meat with relative physical ease. This is the best manual grinder on the market, plain and simple. It’s an inexpensive, sturdy alternative to a much more expensive electric grinder. Don’t be fooled by its price, this grinder can produce high quality product; granted the user puts in the labor. If you’re looking for a meat grinder, but you aren’t sure you’ll use one enough to justify a more expensive electric model, the Gideon Hand Crank Manual Meat Grinder is the best option on the market in terms of cost for quality. This behemoth of a grinder from LEM products is a work horse in every sense. As a size #22, this grinder can handle the largest cuts of meats with ease. The innovative Big Bite technology distinguishes this model over its fellow #22 grinders. 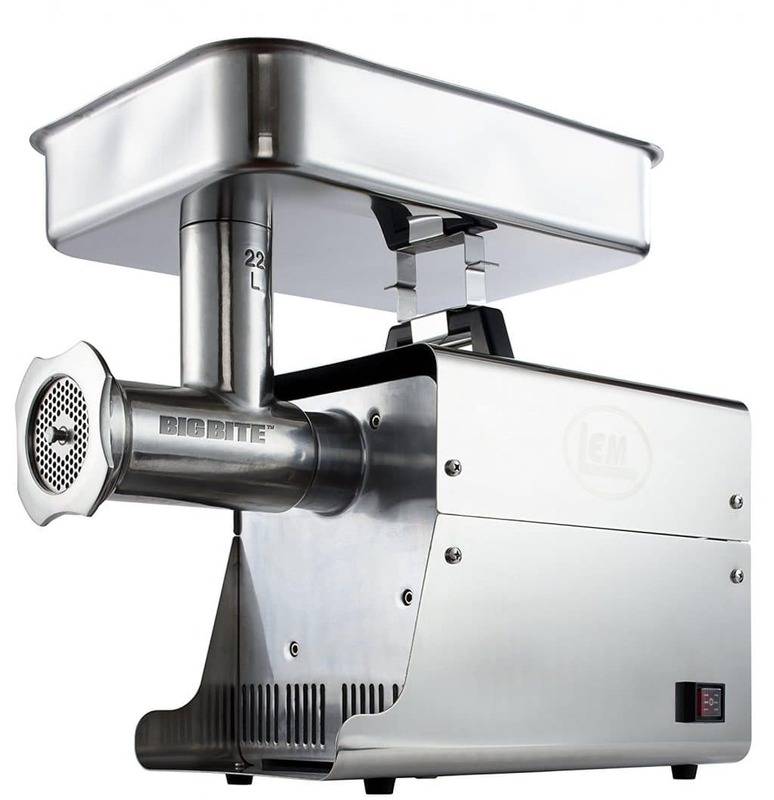 It allows the auger to take a larger bite out of the meat and subsequently send more meat to the grinder, which allows for extremely large cuts without the worry of clogging. Its high workload does have some drawbacks, as this grinder weighs in at a whopping 65lbs, and boasts dimensions of 12" W x 22.5" L x 19" H.
This grinder will be a mainstay on your counter, as its gargantuan size and considerable weight make movement and storage impractical. Its design, however, is very ergonomic. It boasts a stainless-steel design, which, coupled with simple product assembly and adequate safety features, renders this model incredibly user friendly. In terms of productivity, customers rave about the machine’s efficiency and quality. It’s official description lists is production rate at 13lbs a minute, though some customers reported closer to 4. Regardless, it goes without saying that this product can handle just about any meat grinding project, and can do so with relative ease and speed. While this product boasts incredible power, efficiency, quality, and usability, its cost and size render it a poor option for many home cooks.This grinder is a great option, potentially even the best, for those cooks looking to grind significant amounts of meat, as well as for those who know they will get plenty of work out of it. However, for those new to meat grinding, or those who will use their grinder sparingly, its significant cost, inconvenient size, and numerous shipment issues make this powerful product one to avoid. This grinder is a fantastic option for the at-home chef. This product boasts a small, convenient size at only 7 pounds, though you wouldn’t be able to tell based on its disproportionately strong motor. The 500-watt motor can grind through meat quickly and efficiently, and handle nearly anything a home chef could need. This grinder by Gourmia is very affordable and on Amazon; it’s a fairly modest price for an electric meat grinder, particularly when one considers this model’s stellar efficiency. Consumers rave about the usability of the product, as it is easily assembled/disassembled, simple to clean, easy to use, and equipped with a safety switch. This grinder comes with three distinct stainless-steel grinding plates (fine, medium, coarse), though the rest of the grinder is made up of a less strong metal, which many customers have taken issue with. The GMG525 also has the ability to run both normally, as well as reverse, which sets itself out from many grinders on the market. We strongly recommend this grinder to any chef looking to try grinding their own meat, as its price, as well as it numerous features, make it a wonderful product. In terms of its metal, we would certainly exercise caution. Make sure to clean the grinder routinely and check for any signs of corrosion. If found, we would suggest contacting Gourmia directly. 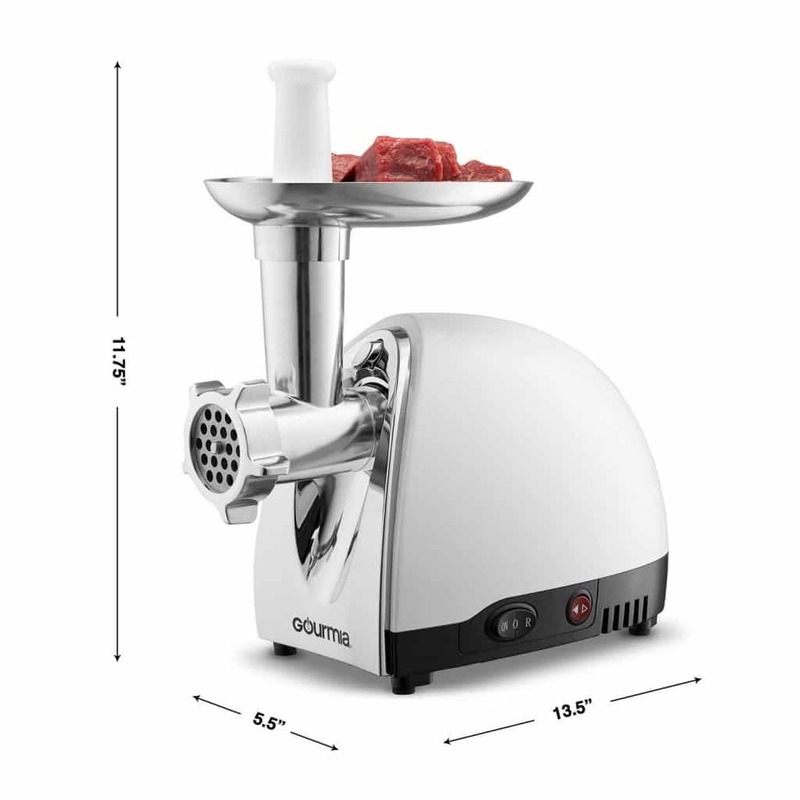 The Gourmia GMG525 Electric Meat Grinder will get your meat cutting job done. This product is one of the most cost-effective on the market and provides at home chefs a fantastic first grinder. While the metal corrosion may be worrying, it’s worth noting that the few customers who did report having trouble with this grinder were outnumbered by a vast majority. In sum, this grinder is of high quality, and is a great choice for any chef that is new to meat grinding. This commercial model by STX is an innovative meat grinder, and a fantastic option for any small business or even at home chefs. Its patented air-cooling design has been said to double the products lifespan, which is already large due to its sturdy construction. This size #12 model by STX comes with 6 different grinding plates, 3 different blades, both sausage and kibbe tubes, as well as three different grinding speeds. As an added bonus, STX has included optional foot-pedal grinder control, for those who are looking to grind meat for significant periods of time. 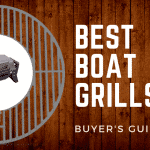 The motor packs a 2000-watt punch and can readily cut through even the toughest of meats. Weighing in at only 13 lbs, this grinder is incredibly portable, and can be stowed away if necessary. However, this particular meat grinder has two designs to choose from in the hopes that it will be aesthetically pleasing enough to become a counter mainstay. Additionally, this product is slightly more expensive than its competitors, although vastly superior in quality. The STX International STX-4000-TB2-PD is the best commercial grinder on the market. Its numerous features and customizable parts render it incredibly versatile and efficient. The patented air-cooling technology effectively acts as the warranty for this product, as it is said to double its lifespan. This model is a work horse and will power through any meat you give it. While the product may have a steeper price tag than some, as well as some issues with its metal, this STX product is a fantastic choice for small business or for those at home chef’s who want to bit more out of their meat grinder. 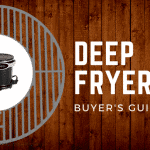 Looking for a meat grinder can be difficult, particularly for first time buyers. With so many options, features, and additions to ponder, it can be easy to get bogged down (pun intended). To avoid indecision, as well as avoid any potential regret, it’s important to establish what you want to get from your grinder. Have you ever used a grinder before? How often will you use it? How much meat will you grind? What are you grinding for? What’s your price range? These are all questions that will help you immediately narrow your options down. Any of the products listed above will produce high quality ground meat; it is simply up to you to decide which of them is best for you. Whether that be a heavy duty electric grinder, or a small manual grinder, will depend on personal preference. Keep cost, labor, efficiency, design, and ergonomics in mind, and then feel confident that you’ve purchased a great product that will help you eat a healthier diet and improve your culinary skills.